My primary concern when I got to Boston was how I was going to get all of my leftover books home. I’d ordered a case of Wonder Woman Unbound from my publisher that I picked up in Boston, but my suitcase was already packed to the gills. I had no room whatsoever for bringing any remaining books back with me. Then to my complete and utter shock, I sold out of books before lunchtime on Sunday. So, problem solved. I was blown away by how great Boston Comic Con was, and how well the book went over. Me and my table mate, Kate Leth, were way in the back corner and subject to some lengthy dry spells at times, but folks found us. After a somewhat slow Friday, things were insane for both of us on Saturday. I sold a ton of books and handed out loads of bookmarks, and I got to have a lot of great conversations with people about Wonder Woman which is always an excellent time. This was my first convention with Wonder Woman Unbound, and it was such a cool feeling to have someone walk by the table, notice the book, and come over to check it out and chat. I’ve got lots of lovely comments online and such, but getting to actually meet people in person was really wonderful. Tabling with Kate made the convention especially fun because a) Kate is a fantastic time, and b) her fans are pretty great too. The future of comics is definitely women in their 20s with alternative haircuts, and they’re a delightful bunch. I’ve known Kate for a while, and it was very cool to see the people her work has inspired, and to hear about her exciting upcoming projects; the gal got like a million awesome job offers just in this three day span. Plus she got to meet the epic punk Captain Marvel she’d been completely enamoured with all Saturday; good lord, the both of us were barely keeping it together when she came over because Kate had been talking about her ALL day. Everything’s coming up Kate, and deservedly so. I also got to meet a lot of Kate’s awesome comic friends, like Ming Doyle, Babs Tarr, Maris Wicks, and more. I’m even more confident than I ever was that these women are soon going to take over the comic book industry. They’re ridiculously talented, they have legions of fans, and they stick together. They’re about ready to bust through the remaining boy’s club barriers that litter this industry and take over the show, and it’s going to be amazing when they do. I met some other cool folks as well. Mark Doyle, the Bat-editor, came by our table, and after chatting with him I am extremely confident about the future of the Bat-books. He’s pushing hard to put out a variety of different Bat-books after years of homogeneity, and I get the feeling that the new Batgirl, Gotham Academy, and Catwoman are only the tip of the iceberg. I also met artist Sean Murphy, and Kate and I did our best not to completely flip out like the nerdy fans we are, with some moderate success, I think. Scott Snyder came by too, which was crazy cool. He was nice and friendly and congratulated me on my book and such. The guy’s a real gentleman. Plus, Khal Drogo walked by our table! Jason Momoa was in the celebrity section doing photos and signing stuff, but did a lap around the convention Friday evening and he totally walked right by us. We completely flipped out as soon as he was out of sight. It was SO good, you guys. The detail was unbelievable. We got to share our back corner of the convention with a lot of cool creators. We had some caricaturists next to us who were a lot of fun, and directly across from us was Erin Cardiff, who premiered her new comic Lost Angels at the con, which she wrote with art by Deena Pagliarello. It’s a comic created by women and starring women set in 1950s Hollywood, and you should definitely check it out if you get a chance. So overall, Boston Comic Con was fantastic. I’m definitely forgetting a lot of other awesome stuff that happened; it was a super packed three days. Thanks to everyone who came by my table and got a book or a bookmark! It was so nice to meet everyone, and I still can’t believe I sold all of my books. It was overwhelming in the best way. 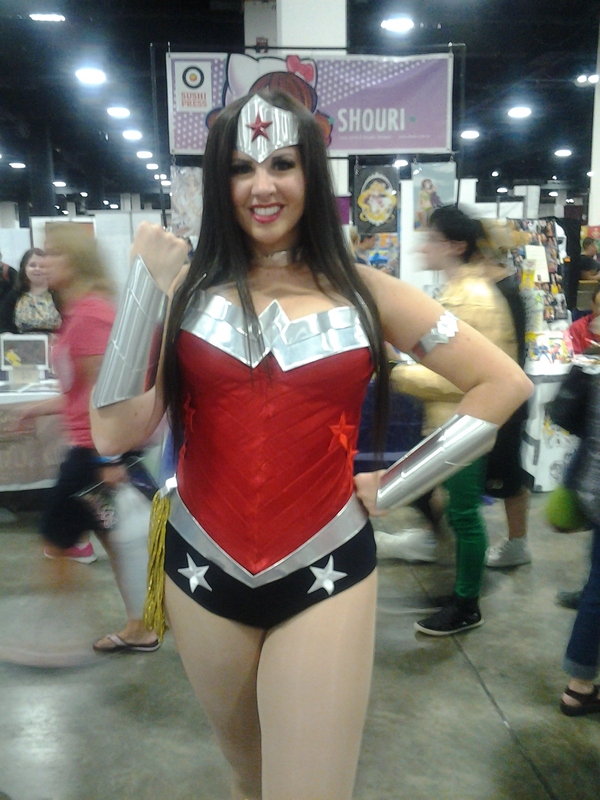 This entry was posted on August 14, 2014 at 3:12 pm and is filed under Wonder Woman Unbound. You can follow any responses to this entry through the RSS 2.0 feed. You can leave a response, or trackback from your own site. It’s even awesomer in person. Kate and I were blown away when we saw it up close. The gal was tall and strong too. SUCH a Wonder Woman. It was so great.